When Annie's parents force her to spend the summer with her grandfather in South Carolina, she decides to take matters into her own hands, risking a daring escape in Grandpa's rickety old boat. Thanks to the bearded, local singer Gregg Russell, Annie's near disaster is averted. After that, Annie decides to make the most of her summer -- which becomes a very special summer for everyone. 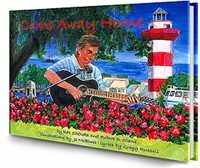 Come Along Home takes place in beautiful Hilton Head Island, South Carolina, featuring famous landmarks, local flavor and historical references unique to Hilton Head Island! This is a wonderful souvenir for your visit to Hilton Head or a thoughtful gift for any young person in today's hectic life. Written by Kat Shehata, a Benjamin Franklin Award winner and Robert D. Slane screenwriter and filmmaker, producer of the Come Away Home movie. Grandpa teaches Annie to play chess, one of his favorite pastimes.